Virgin Voyages, the new lifestyle brand set to disrupt the travel industry, is returning to its Virgin brand roots and creating an incomparable music experience on their first ship, Scarlet Lady. 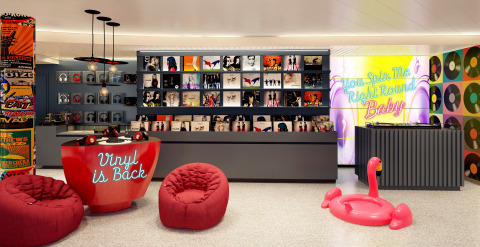 Due to set sail for its inaugural season in 2020, Scarlet Lady will be equipped with an on ship record shop called Voyage Vinyl, The Groupie, a private karaoke and gaming lounge, and perfectly curated music and performances by up-and-coming artists as well as music trendsetters for Virgin Voyages’ Sailors to enjoy. Virgin Voyages’ residency program will feature performances by world-class talent on ship, in-port destinations and at The Beach Club at Bimini. Just last month, Virgin Voyages announced that the Grammy and Oscar-winning DJ, songwriter and record producer, Mark Ronson, has committed to four performances at The Beach Club at Bimini in 2020. Based on Sailor demand, the company has expanded the star-studded residency music lineup to include the multi-platinum chart-topping artist, DJ, producer/remixer, MK (Marc Kinchen), who has committed to one performance in 2020. The Grammy-nominated electronic music duo Sofi Tukker, known for their smash-hit Best Friend, will also join the Virgin Voyages residency program.